This was an Easter surprise bought for me by Tilly, who has discovered a lovely treasure trove of actual proper ales that are bottled on sale in our lovely town. Given the pale offerings from our local supermarket and even from the local Co-Op (colour me well surprised) this was a happy find. 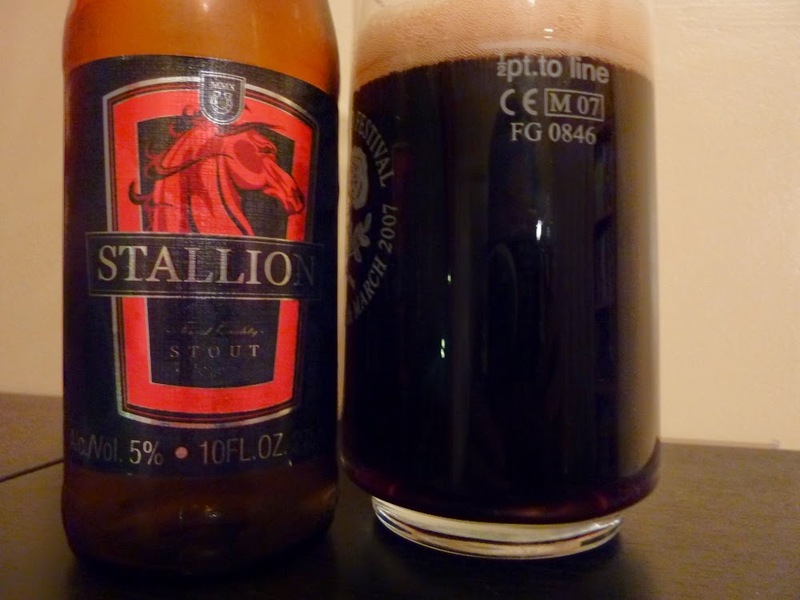 This lunchtime, I am able to bring to you thoughts on a completely different type of ale that I have never seen before, though my experience is rather limited, and that is Banks (Barbados) Brewery's Stallion. The small bottle immediately piques my interest as my limited experience with beers sold in small volume tells me that this could be a good one. It is a stout and, as I am learning, I do rather like my dark and deep ales. The label is an interesting one too, with not too much to say about the contents. A healthy snick upon opening suggests a great deal of carbonation. Yet the pour rapidly shows that this is not the case. There is an immediate strong aroma of malt and chocolate biscuit - like a cheesecake with plenty of cocoa. A big creamy head is formed but it lasts very little time, dissipating before I managed to even get a picture (that isn't mine up there). Very dark colour, near black, puts me in mind of the excellent Libertine that I had Oop North. The first sip of this attractive 5% ABV dark stout is not disappointing. There is a deep chocolate flavour that compliments the biscuit aroma, rich and thick like a Christmas fruit cake with a biscuit base. The aroma and the taste work well together and I can recommend a glass with a thin enough neck to get the effect. I can't place any hops in this, apart from some bittering toward the end of the taste and in the aftertaste, like cherry actually now as I think about it, but the malt is plenty strong and interesting enough to carry it. There is a pleasant and surprisingly clear aftertaste that puts me in mind of Black Forest Gateaux, though I would prefer this ale to the actual cake. Enjoy this as a dessert ale, to have alone or with rich and decadent desserts in accompaniment. It is perhaps best suited to the festive season or to late autumn, and is definitely one I shall revisit around that time of year. Alas, I was unable to let this one lie that long as the date on it was July 2014. But I would recommend getting it in for a Christmas do, serve it with proper posh cakes and biscuits, maybe with cheese instead of coffee, and settle in for a long and pleasant evening shooting the breeze and dissecting the Queen's Speech.